Toni Ebdon is a believer in the power of breast milk. Long thought to have healing properties, like warding off diarrhea, fighting cancer, and boosting the immune system, those folk remedies have turned leftover milk into folding money as men have been buying Toni’s breast milk online. 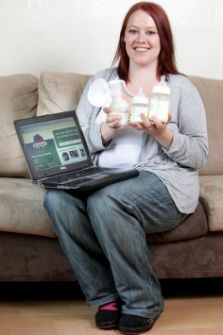 When she had her son, Toni was producing so much extra breast milk that friends joked she should start a dairy; that’s pretty much what she’s done, selling her breast milk online at a rate of 15 pounds for 4 ounces. Toni has ten regular customers buying her milk, though they get theirs after her baby has his. While the money isn’t great, it’s better than not working, and Toni intends to keep the business going for as long as she has spare breast milk available. You really can’t blame her, as she’s turning something she’d normally pour down the drain into free money! We should all be so lucky.